If you’ve ever seen the amazing Bill Murray movie What About Bob?, you already know his theory of the world that claims there are only two kinds of people in it—those who like Neil Diamond and those who don’t. Well, I don’t know exactly how I feel about Neil Diamond, but that’s also how I categorize people, except I substitute ND with pizza. And even within the group of people who like pizza, there are those who like it and those who love it. I really love it. Actually, if I were brave enough, I would admit to you that I had it yesterday for lunch, ate pizza rolls later as a late night snack, and I’m having it again today for lunch. It just always sounds good! 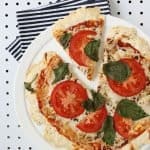 I like all kinds of pizza, but thin crust has a special place in my heart, and I wanted to find a fast and easy thin crust recipe so I could make pizza from scratch more often. If you’re wanting to cut down your pizza dough making time, a yeast-free option is the way to go, and I tried a few options before I found one that I think is the best. Thin Crust Pizza Dough (Yeast-Free), makes two 10″ pizzas. Mix your flour, baking powder, and salt together in a mixing bowl. Mix your water and olive oil together in a separate small bowl and add into the dry mixture as you stir. When it’s almost combined, use your hands to gently knead the dough together. Add small amounts of extra water if needed. You want your dough to be dry enough that it doesn’t stick to your hands, but wet enough to stay together when you squeeze it. Once the dough is the right consistency, divide it into two balls, cover, and let rest for 10 minutes. You can roll out your dough between two sheets of wax paper, but I actually like using a lightly floured counter instead (I think I can get it a little thinner that way). You want to get the dough as thin as possible, but shoot for around 1/8″ thick. Turn your oven to 425˚F and lightly grease a baking sheet or pizza pan. Place the dough on the sheet and prebake your crust for about 10 minutes or until the crust just begins to brown slightly. Add your sauce, cheese, and pizza toppings, and bake your pizza for another 10 minutes or until the cheese and crust are golden brown. Slice and serve immediately. Mix your flour, baking powder, and salt together in a mixing bowl. Mix your water and olive oil together in a separate small bowl and add into the dry mixture as you stir. When it's almost combined, use your hands to gently knead the dough together. Add small amounts of extra water if needed. You want your dough to be dry enough that it doesn't stick to your hands, but wet enough to stay together when you squeeze it. You can roll out your dough between two sheets of wax paper, but I actually like using a lightly floured counter instead (I think I can get it a little thinner that way). You want to get the dough as thin as possible, but shoot for around 1/8" thick. omg I am right there with ya, girl! I have a secret (not so secret anymore) bucket list item which involves me eating an entire 16 inch pizza (im from NY, its the only size I know and I won’t argue either). I know I can do it! This looks delish. Now I need pizza. Why didn’t I think of that ? I love pizza I love thin crust I actually love any pizza ! Thanks ! Oh my, this looks just SO delicious! Thanks so much for this…I’m definitely a thin crust gal as well…I’d rather eat my calories in cheese than crust ;). I love thin crust pizza. This one looks delicious! Oh my… I want pizza! Now! I love both! I’ve also tried a recipe like this before, and it’s great when the pizza craving hits, but you don’t have 2 hours to make yeast dough! I’m glad to know I’m probably not the only one who always has pizza-making supplies on hand! I can’t decide! Thick. Thin. It’s all good. I like my pizza with vegan cheese or no cheese but with lots of broccoli or rapini! Yum, pizza. Nice to have a yeast-free option. Thanks. This is the crust for me! I don’t like waiting for yeast to work, so thank you!! ommmggg this looks so delish! yum! this pizza looks perfect! Caprese pizza is my favourite! I could never be friends with someone who didn’t like pizza. I mean, how is that humanly possible?! Thin crust is my favourite! I love a good selection of pizza toppings, too. Oh that looks like the best pizza! Yumm! I love an good excuse for yummy pizza! Semms really good!! I am going to try this recipe! I made this yesterday and it was delicious. I see there is a photo that shows fork marks in the crust for ventilation, but you missed this step in the text. My crust bubbled because I was paying attention to the text. Maybe you could add in the crust piecing before prebaking the crust. This crust is delicious and semi quick to make. Definitely faster then a recipe that uses yeast. I make a BBQ, chicken &onion pie as well as a turkey pepperoni and turkey sausage with mushroom pie. I also make my own red sauce for the turkey meat & mushroom pie. Sauce: 1 small can tomato paste add 1 can of cold water. Mix in Garlic powder, onion powder, oregano, basil , salt, olive oil. All to taste, Approx. 2 teaspoons of each spice with the exception of the salt. I use pink hymalaion sea salt and approx. 1/2 tsp. But it’s all about individual tastes. Add more or less of all the above ingredients to your personal taste. My family enjoys savory with this pizza pie. Occasionally & I also include fennel seeds (1 tbsps.) to the red sauce because we enjoy the bite it adds. The BBQ Chicken & onion is deffinately sweet and savory. I use Baby Rays Original BBQ sauce and 1 sliced medium sweet onion or red onion (depends what I have on hand) Lightly sautéed while I am sautéing 1 small boneless, skinless chicken breast. (Chicken add titch of S&P with light spray of Pam in a sauté pan on Medium High heat for approx.. 6 minutes on each side)Reach internal chicken temperature of 165 degrees. Rest a few minutes. Then pull breast apart with knife and fork. Add BBQ sauce to the prebaked crust, add slightly sautéed onions with pulled chicken & mozzarella cheese. About 2 cups of cheese per one homemade pizza crusts. *WE LOVE CHEESE* I hope you enjoy these pizza pie recipes. Feel free to reach out if you have questions about my recipes! Thin crust ? ismy favorite have a great,weekend.✌❤? Just made this and it’s delicious and so easy! Definitely my new go-to crust! FINALLY!!!!!! 5 pizza recipes in 5 days and this is the only one I’ve been able to eat!!! Thank you so much, and my mom says thank you, too. My pizzas grew huge crispy bubbles in the middle when doing the pre bake. Did I bake it too long? I pulled them out at 8 minutes. Have bubbles in your crust?? DON’T forget to stab your pizza all over with a fork so the air will be able to escape. This prevents the bubble problem!